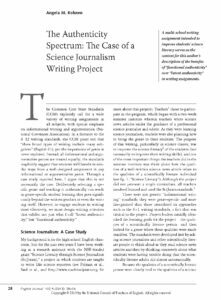 Summary: The SciJourn project, in which students learn to write like science reporters, was initially designed to help students develop scientific literacy. However, it became much more — a key to high school students’ engagement as learners, researchers, and writers and their teachers’ opportunity to explore “real world” genre-based writing assignments and assessments. This article provides a rich discussion with specific examples that can guide teachers in developing writing assignments and learning experiences that take into account “functional authenticity.” Those designing professional development, grants, summer institutes, or study groups on topics such as disciplinary literacy, genre, or authentic learning/writing will find ample food for thought! But ‘real world writing’ includes a great many genres; what the notion of functional authenticity also forces us to consider is the differences between these genres—both in our instruction and in our assessment. Really teaching genres, and determining how to assess them, requires that we think about more than just what the genre looks like on the page (or screen), but also what the genre requires of the writer.